Every week we will have a walk or a talk (or both) meeting at Trelowarren New Yard. Each week we will have an expert in the field give an interesting talk in and around Trelowarren. Survival Wisdom are coming to talk about Natural Navigation.They will lead you through Trelowarren being guided by nature. Explanations of survival wisdom will guide you through the unknown until you arrive back at the New Yard. The company Survival Wisdom has unique wilderness experience and have lead expeditions and operations throughout the world. The instructors each have a background ranging from helicopter pilot to parachute jumping instructor, you can be sure of a real adventure. The team will deliver a theiretical and practical experience which will enhance your knowledge for natural navigation. 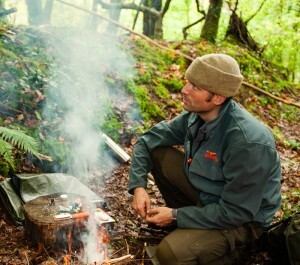 Self reliance and insight into survival techniques are part of the schedule for the other courses that they offer. If you enjoy this taster session you might like to learn about the other courses that are available here at Trelowarren including: Bushcraft, Natural navigation and expedition training. 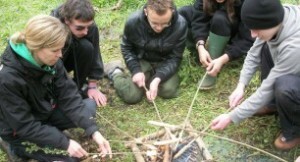 An ideal opportunity to for both adults and children to experience a taster bush craft session provided by BF adventure. Taking you around Trelowarren you will learn more about the environment and survival skills as well as improving your confidence, problem solving and working as a team. basic problem solving, canoeing, abseiling, climbing, swimming, snorkelling, kayaking, archery, power boating, orienteering, bushcraft and survival skills, camping, surfing, coasteering and independent living skills (budgeting, cooking, planning, job search skills, IT, basic numeracy and literacy). Learning with Nature – Outdoor learning with a focus to encourage, enrich, enable and inspire. Adventuring into the wilds of Cornwall – join us in the woods of the Trelowarren Estate and experience the natural world ‘ with a twist’! Play games, create art, build dens and fires, write poetry, learn what it is like to be a spider and much much more. Learning with Nature delivers outdoor learning on and around the Lizard Penisusular. This taster session will introduce you to the delights and secrets of this exciting habitat. We believe that every child benefits from time spent in nature, and that a love of the natural world and a knowledge of their immediate landscape fosters a care and respect which will stay with then throughout life. Step by Step, the physical, mental and emotional challenges experienced in nature enable children to develop skills which they can then transfer into all areas of their lives. Please meet in the New Yard at 5pm. All of the activities are free. (please book as spaces are limited) fun for children & adults.